This bug seems to come and go in Outlook 2016. It works as expected in some builds, does not work correctly in others. 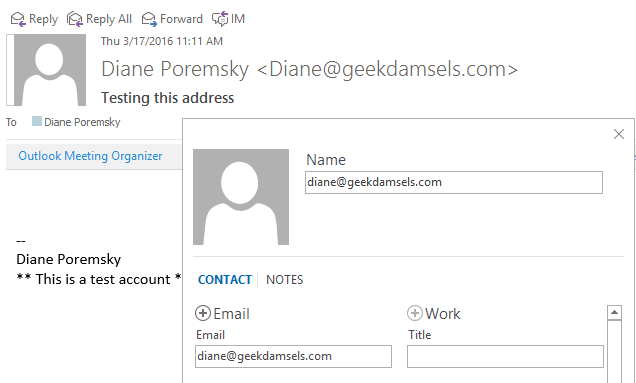 When you right click on a sender or recipient in an email header and choose Add to Outlook Contacts, a new contact is created and displayed in the Contact Card. While Outlook is supposed to put the display name in the Name field and the email address in the email address field, in some builds, it uses the email alias (the part before the @) as the full name. The person's display name is correctly added to the email display name field, so Outlook knows it's there, it's just not using it in the name field. Although it's not as obvious with this email address because the alias is the first name, when the bug is present, the address initially populates the Name field. (The domain is removed when you click Save). This is how it is supposed to work - Outlook gets the display name from the message and uses it in the Name field. The workaround is to set the TurnOnLegacyGALDialog registry value. With this key set, using the Add to Contacts command will open a full contact form, not the contact card. It also brings back the Email Properties dialog. Users might also want to disable the hover card – this is the mini contact card that pops up when you hover over an address. With hover functionality turned off, it won't pop up when the mouse moves over an address; you'll need to right click on the address to show the card.